If you had to draw up a scenario to maximize foot traffic on the north end of the Atlantic City Boardwalk, it would look something like this: a Saturday night in the summer, comfortable weather for walking the boards, and a big-time boxing match or concert at the Hard Rock to reel people in who otherwise would have little interest in coming to AC. About the only thing that could make it more guaranteed to draw a crowd would be a holiday like either Memorial Day or Labor Day weekend. 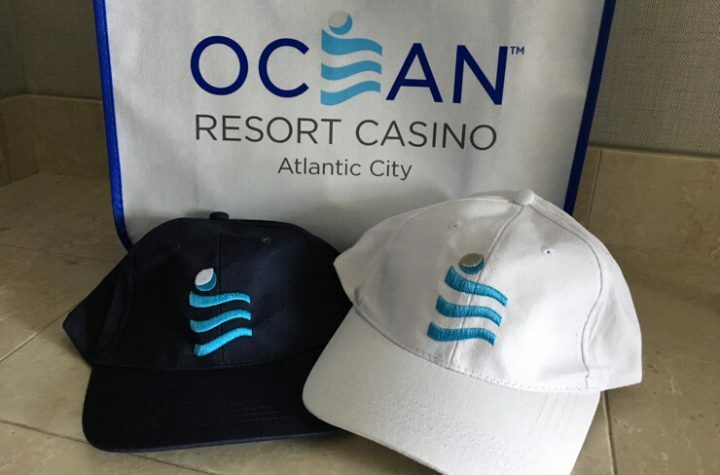 I spent this past weekend in Atlantic City — I stayed at Ocean Resort Casino and made a couple of trips a half-mile down the Boardwalk to the Hard Rock — and given that it was indeed a temperate summer weekend featuring the biggest boxing match AC has hosted in almost four years, it probably wasn’t the best test case for determining how well Ocean and Hard Rock are doing. Both casinos (re)opened on June 28, and the fact that they were both crowded on August 4 doesn’t prove a thing about their long-term viability. But they were both crowded. So at least we don’t have to jump to any negative conclusions yet. Ocean rose from the ashes of Revel Casino Hotel, which was operational for barely two years before shutting its doors on September 2, 2014. Hard Rock is a remix of Trump Taj Mahal, which closed on October 10, 2016, after a 26-year run. Hard Rock is a recognizable brand and an easily identifiable gimmick, as tourists will come just to eat at the Hard Rock Café or check out the music memorabilia lining the walls. Ocean is located at the farthest end of the Boardwalk; you have to go past Hard Rock to get to it. This is a big part of why Revel failed: It’s not a location that’s conducive to people popping in casually and spontaneously on their way from one place to another. Hard Rock hosted Saturday night’s Eleider Alvarez-Sergey Kovalev boxing match, which drew a sellout crowd of 5,642 to Etess Arena. When the fight let out around midnight — with the crowd buzzing and adrenalized by Alvarez’s shocking seventh-round upset knockout — it was the Hard Rock’s slots and table games that naturally absorbed most of the action. Still, both casinos looked like thriving businesses during peak Saturday hours. Ocean experienced a highly inconvenient mechanical fail: The lone escalator going up from the Boardwalk level to the casino level stopped working for several hours during prime time on Saturday. That meant a full-on mob scene waiting to get on elevators. That’s unfortunate (and maybe a bit symbolic of how Revel/Ocean can’t seem to catch a break). But at least there were enough people there to create a mob scene. At various other times over the course of the weekend — Friday evening, Sunday morning — Ocean felt like it was headed for the same struggle Revel encountered during its brief life. The property is spacious, but perhaps overly so. At all times other than Saturday afternoon and evening, countless beautiful areas, especially on the hotel side, were virtually unused. Long after the fights let out on Saturday, at around 2 a.m., the casino floor at Ocean was still doing decent business. But a trip upstairs to the hotel lobby bar almost made you wonder if you had been transported to some date between September 3, 2014 and June 27, 2018. We listed above three advantages Hard Rock holds over Ocean. But there’s one edge — perhaps a minor edge, but an edge nonetheless — that Ocean holds. The William Hill Sports Book (at least a temporary version of it) is open for business at Ocean, whereas Hard Rock has no sports betting. Neither does Showboat, which is only a hotel property with no gambling. 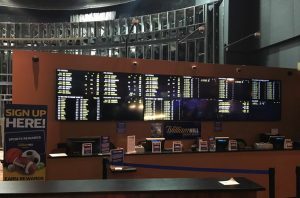 The only other sports books in AC right now are at Borgata (in the Marina District, a drive of several minutes from the Boardwalk), Harrah’s (also in the Marina District), and Bally’s Wild West Casino, which is way down on the south end of the Boardwalk, closer to Tropicana and Resorts. The Trop hasn’t announced sports book plans yet, but physical construction is underway. It’s logical to assume that, in time, the five AC casinos currently without sports books will join in on the fun. And of course, mobile sports betting is starting up, with one operator in beta mode and several others soon to follow. But for now, Ocean has that advantage, and the lines to place bets were long on Saturday night, sometimes requiring a 10- or 15-minute wait before reaching the ticket writers. As with all things in Atlantic City for the last 15 years, Borgata is the king, and its sports book traffic currently puts Ocean’s to shame. But that unflattering comparison aside, the William Hill book is doing okay for itself. There’s no shortage of betting options. You name a sport, Ocean offers it, from baseball and football to boxing, UFC, golf, Formula 1, NASCAR, and even the Canadian Football League. And bettors aren’t limited to simple money lines and point/run spreads. In MLB action, for example, the Ocean sports book offers a money line, a run line, run totals, lines for the first five innings, bets on whether either team will score in the first inning, total runs/hits/errors in each game, total runs scored in all of MLB on the night (called the “MLB Grand Salami”), whether a grand slam will be hit, and whether a no-hitter will be thrown. For what it’s worth, the grand slam vig is small: +110 for yes, -130 for no. The no-hitter vig is outrageous: +2000 for yes, -7000 for no. As it so happens, a no-hitter occurs once every 1,562 games. So the “no” on no-nos is still a great value bet at -7000 … if you’re willing to risk $7,000 to win $100 and sweat the potential disaster. Hard Rock and Ocean have only been open about five weeks, making it far too soon to draw any meaningful conclusions about whether Borgata will eventually have real competition in AC or even whether either property will still be open a few years from now. The early presumption is that Hard Rock is a safer bet than Ocean. But for both, the real test will come in the offseason. Can they lure gamblers, diners, spa-goers, etc., there in the fall, winter, and spring? 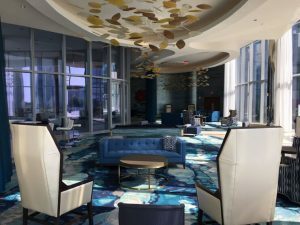 Atlantic City is in a growth pattern for the first time in more than a decade, and its two newest casinos felt alive this past Saturday night. Nobody’s offering odds yet on whether Ocean and Hard Rock will succeed or fail, but the sharp bettors would be wise to hold onto their money and see how the lines move in the months ahead.